How fast can you go in a small cruising boat? Gerry Spiess and Yankee Girl arrive in Honolulu. Pic by Marlin Bree. 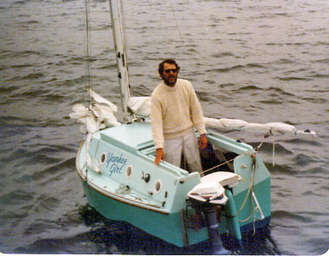 Gerry is the champion small-craft sailor who set two world’s records by sailing his 10-foot homemade plywood sloop, Yankee Girl, across both the Atlantic and the Pacific Oceans. On the long reaches across the Pacific, he took only 34 days to sail 2,539 miles from Long Beach, California, to Honolulu, Hawaii. He had averaged 74.5 miles per day—an extraordinary run for a heavily laden boat with only a 9-foot waterline. Much larger sailboats do well to average a little over 100 miles per day. He was bettering his North Atlantic record run. He had sailed out of Virginia Beach, Virginia, heading eastward to England. That sail took him an elapsed time of 53 days, 5 hours nonstop to Falmouth, 3,780 statute miles. He had averaged 60 miles a day an average speed of 2.5 miles per hour in storms, high waves, doldrums, and some good sailing. His best day’s run was 84 nautical miles. Out of Honolulu and in the South Pacific’s trade winds, Yankee Girl began hitting 100 miles per day under her twin 29 square foot jibs.His best day’s run: a whopping 138.09 miles. Marlin Bree (www.marlinbree.com) is a contributing writer to Small Craft Advisor and the author of numerous boating books. He has twice won the coveted Grand Prize Award in Boating Writers International’s annual Writing Contest. Found the article interesting. Is there more information on this boat and its creator? I’m certain this is the yacht that I remember sitting on the wharf at the submarine base, HMAS Platypus, in Neutral Bay, Sydney, Australia, some time in the early to mid 1980s. I can still recall my surprise at being told how far this tiny vessel had sailed. Life on a diesel powered submarine didn’t seem so difficult after that. Gerry ended his Pacific run in Sydney, Australia, so if you saw a green hulled and white topside sloop of 10 feet LOA that probably was Yankee Girl. It is kind of unmistakable. Via ham-band radio, I had talked with the sailor the night before, when he was at anchor waiting to come in the next day, escorted by a Sydney yacht squadron. He timed things beautifully. He had changed out of his cruising gear and into his cheers gear which was not quite so grubby. It was quite a reception that Sydney threw for him. For those who are interested, Yankee Girl is owned by the Minnesota Historical Society in St. Paul and right now is gathering dust in storage. You can read more about Yankee Girl and Gerry in my book, Broken Seas, as well as on my website. Click on the book, Alone Against the Atlantic, as well as (for the Pacific run), Broken Seas. Look for: Ten feet across the Pacific. Have fun.